I've posted before about how to have no page number on the first page. I used the approach of creating the page styles you used. This time I'm just going to show you how to do it using existing page styles, which takes a little of the complexity out. First: Choose Tools > Options > Writer > Printing. Turn OFF the "Print automatically inserted blank pages" option. This inserts an even page between two odds. It shows up in print preview. Don't worry about it; just turn it off unless you are doing books. 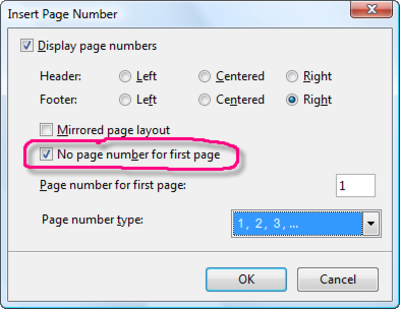 Now: How to have no page number on the first page, and have the page number on the second page start with either 1, or 2. 1. Create or open your document. 2. Type the content you want on the first page. You don't have to do it all, but let's say you've got some there. 4. 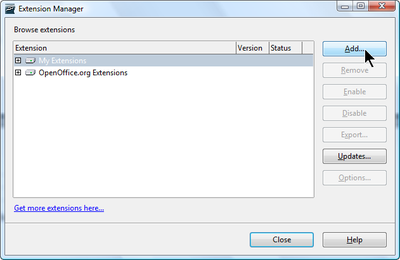 Click the indicated Page Styles icon, fourth from the left. 5. Double-click the First Page page style. It will be highlighted and applied to your whole document no matter how many pages you have. You can see that it's applied in the lower left corner. 6. 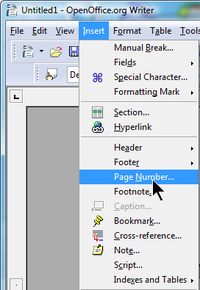 Click at the point in your document where you want to switch to page 2. 7. Choose Insert > Manual Break. 8. Select Default as the style that you want to switch to, in the dropdown list. 9. 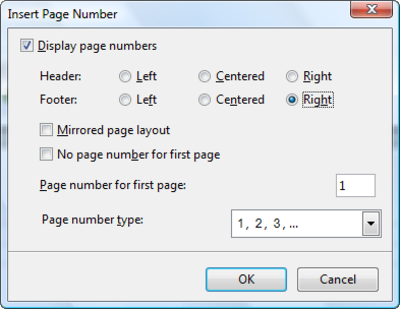 If you want page 2 to have a page number other than 2, select the checkbox and type the page number such as 1 in the box. 10. Click OK. Your second page will look like this. Don't worry about the 3/3, that's related to the option that you set earlier and won't affect page numbering. That's the basics. You now have one page style applied to the first page and a different one applied to the second page. You can modify one without changing the other. 11. Choose Insert > Footer > Default. 12. You now have a footer in the Default page style (second page and subsequent pages) where you can insert a page number. 13. Click in the footer and choose Insert > Fields > Page Number. 14. The page number appears. Format it as desired, center it, add the word "page" in front of it, or any other changes you want. The page number doesn't appear on the first page. You now have one page style applied to the first page and a different one applied to the second page, with different formatting and footer contents applied to each. Note: Upon further testing, this works fine as described but the table of contents does not reflect the offset correctly. Sorry! I was answering comments on this blog about starting page numbering on page 2, when I mentioned the page number offset, and how it doesn't work. And I thought, well, I haven't tested this in OpenOffice.org 2.1 yet. This means that if you want, and if it suits your document, you can totally skip the whole big thing with page styles simply by inserting the page number field in your footer as usual, then double-clicking the page field and typing a negative page offset. When you insert a page number in a header or footer (or in your page content), you get a page number, of course. This is a FIELD, which means it's not just text, it's got intelligence built into it. The gray shading indicates it's a field. You can double-click the page number and you get this window. The Offset fields at the bottom right is what we're interested in here. Type in 4 and your first page number will be 5; type in -2 and your first page number will be -3. Seems like this could be useful, yes? Well, kind of. Read on. Here's what that looks like in the window. Here's the effect on the first page in the document. Here's the effect on another page in the document. So far so good. But here's the effect on one of the last four pages (4 is the offset) in the document. No freakin' page number at all. There's gray but nothing will actually print. So: when you type in a positive offset, where x = your offset number, the last x pages of the document don't have a page number. Let's say you have a cover page, and your content is the second page. You want no page number on the cover page and you want "1" to appear in the footer of the second page. So you want 1 of your pages to have no page number in the footer. Your offset is therefore -1. Double-click the inserted page number. In the fields window, type -1 in the Offset field. And here's the result on your first page. Look at that! It's gray, so that means nothing will print! Which is exactly what you want! And here's what the first page of content looks like, i.e. the second page of your document. Again, this is exactly what you want -- the number 1. And since the numbers disappeared at the beginning of the document, not at the end, you get the correct page numbers all the way to the end of your document. This is great. Much easier than page styles; my apologies for not bringing it to everyone's attention earlier. If you want the page number 1 to appear on your second page, use the offset -1. If you want the page number 1 to appear on your third page, use the offset -2. I've written an article for TechTarget.com about how to bring spreadsheets into master documents, too. 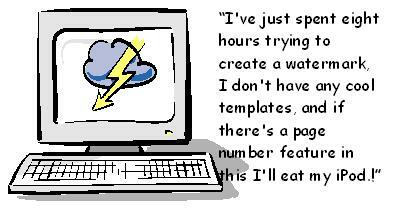 You link the spreadsheet to a Writer document, then bring that "dummy" writer document into your master document. It's a hack but a practical hack since big publications often need to combine different document types. There's an approach (even hackier, but useful) for bringing in presentation content, too. If you haven't read the first article on plain old master documents, read that first. Note: See also this blog on just using the offset feature. Note: This is a repost from December that didn't get published correctly. Also see my post that will be coming Wednesday, on an easier approach if you just want to insert some columns in a document.